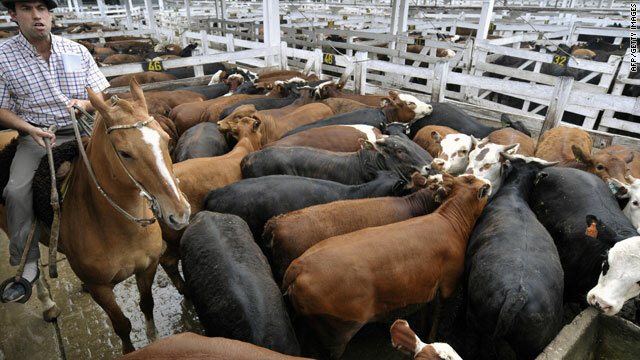 Livestock farming already occupies 30 percent of the world's surface, according to the United Nations. Frank Mitloehner: "Smarter animal farming not less farming will equal less heat"
London, England (CNN) -- A scientist in the United States has questioned the impact meat and diary production has on climate change, and accused the United Nations of exaggerating the link. In 2006, a report published by the U.N. Food and Agriculture Organization (FAO) titled "Livestock's Long Shadow," claimed meat production was responsible for 18 percent of greenhouse gas emissions, which it added was greater than the impact of transport. Livestock farming already occupies 30 percent of the world's surface and its environmental impact will double by 2050 unless drastic action is taken, the U.N. warned. Environmentalists and leading campaigners including Paul McCartney, used the findings to urge consumers to eat less meat and save the planet. Last year the former Beatle's much hyped-campaign featured the slogan: "Less meat = less heat." But Frank Mitloehner, an air quality specialist from the University of California at Davis (UCD), said the U.N. reached its conclusions for the livestock sector by adding up emissions from farm to table, including the gases produced by growing animal feed; animals' digestive emissions; and processing meat and milk into foods. But its figures for transport did not add up emissions from well to wheel; instead, it considered only emissions from fossil fuels burned while driving. "This lopsided 'analysis' is a classical apples-and-oranges analogy that truly confused the issue," Mitloehner said on the university's Web site. Mitloehner also pointed to the fact that leading authorities agree raising animals for food accounts for about 3 percent of all greenhouse gas emissions in the U.S., while transportation creates an estimated 26 percent. "Talking about livestock production versus transport in a world context is meaningless. He said campaigners such as McCartney were "well-intentioned," but "not well-schooled in the complex relationships among human activities, animal digestion, food production and atmospheric chemistry." He added "smarter animal farming not less farming will equal less heat." One of the report's authors, Pierre Gerber, told CNN he accepted the comparison with transport data was inaccurate. "This was not done deliberately," he said. "But the comparability of the data does not challenge the estimate of 18 percent. "It has been endorsed by the scientific community, the IPCC (Intergovernmental Panel on Climate Change) made reference to it, so this is not in doubt. "We thought it would be useful to compare the figures to another sector -- transport -- and I accept this comparison is now a little doubtful." He added that the FAO plans to publish a revised report on the impact of the livestock industry. Meanwhile, Liz O'Neill of British Vegetarian Society -- an educational charity which counts Paul and Stella McCartney among its patrons, told CNN the meat industry remains a hugely significant contributor to climate change despite. "It's obviously convenient to have comparisons but 18 percent is still a really massive contribution," she said. "But it's not only about reducing emissions in this area. We have to do it all. The Vegetarian Society has always been careful never to say 'go vegetarian and then you can go on long-haul flights on your holiday.' We say this is just one of things you can do to make a contribution." Duncan Pullar of the English Beef and Lamb Executive (EBLEX), which promotes the beef and lamb industry in Britain, said the "credibility gaps" on both sides of the argument are making it difficult for consumers to understand the impact of food production. "Talking about livestock production versus transport in a world context is meaningless," he said. I don't understand what it offers us," he told CNN. "There are claims and counter-claims that don't help to create a balanced view of how we should individually and collectively respond. But he added there has been no drop-off in sales of meat across the industry, despite the vigorous media debate about sustainability in the food industry. Last year, climate change skeptics claimed emails leaked from a leading UK research unit showed an attempt to falsify data to exaggerate the threat of global warming. One e-mail allegedly sent by the head of the University of East Anglia's Climatic Research Unit (CRU), Professor Phil Jones, refers to using "Mike's Nature trick of adding in the real temps to each series for the last 20 years ... to hide the decline." As one of the world's leading research bodies on climate change, the CRU's research was used in the IPCC's Fourth Assessment Report released in 2007, which is considered to be the most authoritative report on climate change to date.